I hate to contribute to the stereotype that Jewish men aren't handy, but I've only constructed two notable structures in my life. One is a backyard tree house for my kids and I've had to hire a handyman three times already to come over and either fix or reinforce that tree house so it would be safe for my kids to use. The second thing I've ever built is our family's sukkah each year. Today is the third day of the 8-day sukkah festival (observed for 7 days in Israel) when Jewish people all over the world eat meals in a temporary hut. The first time I constructed my own sukkah was thirteen years ago during my first year of marriage. Truth be told, I supplied the beer and my non-Jewish (and very handy) next door neighbor did most of the manual labor. Over the years, however, I've gotten better at erecting this 12x10 foot booth with canvas sides and a couple bamboo mats for a roof. This year I put it up in record time with some help from my kids (who are now old enough to be more helpful than hindrance). The sukkah must enclose a minimum area of 7 x 7 square handbreadths. The sukkah must have at least 3 walls, but the third doesn't need to be complete. The walls must remain unshaken by a steady wind. If the sukkah has only 2 complete walls, and they face each other, a third wall of at least 4 handbreadths must be within 3 handbreadths of one of the complete walls. The base of the walls must be within 3 handbreadths of the ground, but need not reach the roof. The sukkah must be at least 10 handbreadths tall, but no taller than 20 cubits. The roof must be made from something that once grew in the ground, and is no longer attached to the earth. The sukkah must have a roof made of schach: the leaves and/or branches of a tree or plant. The roof cannot be made of bundles of straw or sticks that are tied together (although untied straw or sticks may be okay). The sukkah must draw the eye up to its roof, and to the sky beyond. In day, the roof must provide more shade than sunshine. Its individual construction elements must be less than 4 handbreadths in width. At night, one must be able to see the stars from within the sukkah, through the roof. When I was contacted by my cousin (technically my mother's cousin's son), Andrew Hauptman, many months ago to serve as a juror for this competition I immediately agreed. I thought it was great that Andrew was involved in this endeavor and so excited about it. Andrew, a very talented architect in Ann Arbor, isn't an observant Jew and hasn't been very active in the Jewish community so I thought this was wonderful that he was taking a lead in this project. I hope we can create similar events that encourage participation of other Jewish rituals for those who haven't traditionally been involved. Sukkah Arbor, like similar projects in other cities, really gets people involved in the sukkah building process who otherwise wouldn't even know about the Jewish commandment to build a sukkah on the Sukkot holiday. 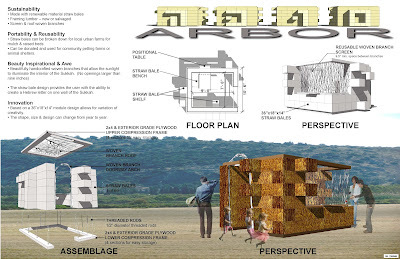 The objectives of Sukkah Arbor were to bring 21st century 'design-build' techniques and materials to a traditional observance, unite the wider community in a participatory, educational and artistic project, and to raise awareness of and educate about modern causes that connect to the holiday of Sukkot including homelessness, hunger and the environment. 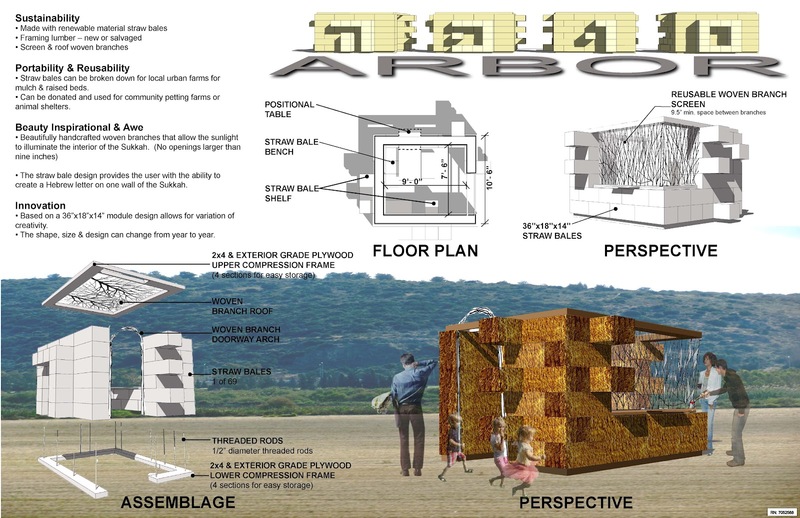 Architects, builders, environmentalists, and artists who have gotten involved in different aspects of Sukkah Arbor have learned about the Sukkot festival and the meaning of the sukkah. The winner of Sukkah Arbor was the "Hay Bales" sukkah created by Harold Remlinger, Ralph Nunez and Shari Stein (pictured above). Mazel Tov to them and to all of the sukkah designers. The sukkahs were originally on display at Liberty Square Plaza and can now be viewed at the Ann Arbor Jewish Community Center. I'm grateful I had the opportunity to be a part of this project and hope it continues for many years to come.